New Zealand’s rugged mountains and changeable rivers made an impression on the first European settlers. 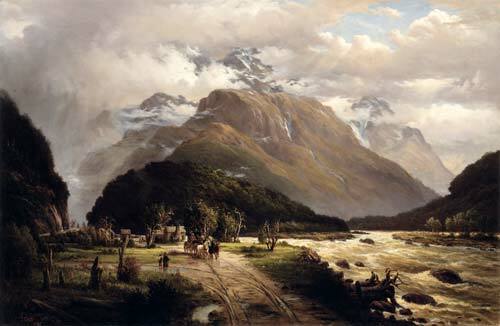 After a road had been built across Arthur’s Pass in 1866, a number of artists painted the mouth of the Ōtira Gorge, on the West Coast. John Gibb called this 1877 oil painting ‘Clearing up after the rain’. Gibb came from Scotland and would have known similar scenes in the Scottish highlands – although the mountains are higher in New Zealand.